YP Simplified Series – Rigless – a misnomer? Applications to Late Well Lifecycles by Steven Canny, Weatherford. YP Simplified Series presents: Rigless – a misnomer? Applications to Late Well Lifecycles by Steven Canny, Weatherford. With the current new “normal” of $50-$60 oil prices, focus has moved from well construction to late life well planning and mature basin management, to exploit infill drilling and postpone cessation of production. One industry segment that has become more visible is “Rigless” technology, applying to light intervention through to heavy well deconstruction and a plethora of others between. What is “Rigless”? Moreover, what are the applications relevant to a mature basin in a cost constrained environment? 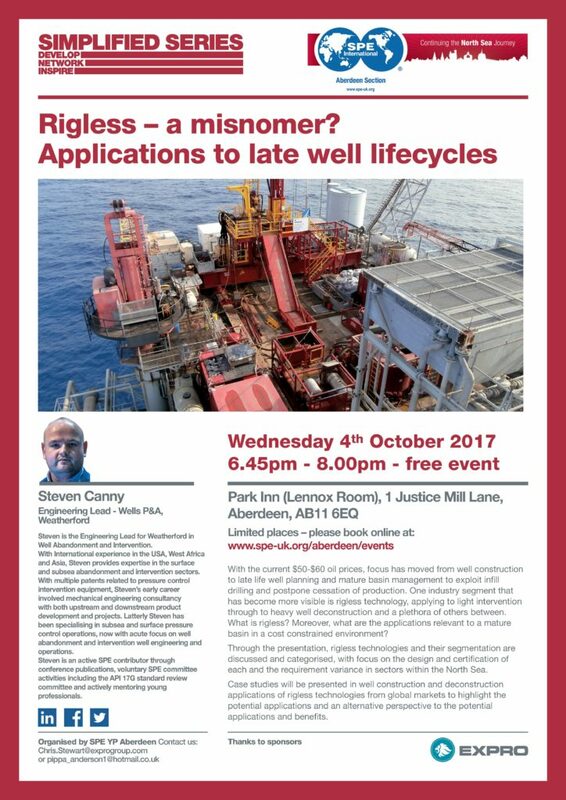 Through the presentation, “Rigless” technologies and their segmentation are discussed and categorised, with focus on the design and certification of each, and the requirement variance in sectors within the North Sea. Case studies are also presented in well construction and deconstruction applications of Rigless technologies from global markets, to highlight the potential applications and an alternative perspective to the potential applications and benefits. Steven is the Engineering Lead for Weatherford in Well Abandonment Intervention. With International experience in the USA, West Africa and Asia , Steven provides expertise in the surface and subsea abandonment and intervention sectors. With multiple patents related to pressure control intervention equipment, Steven’s early career involved mechanical engineering consultancy and involvement with both upstream and downstream product development and projects. Latterly Steven has been specialising in subsea and surface pressure control operations, now with acute focus on Well Abandonment and Intervention well engineering and operations. Steven is an active SPE contributor through conference publications, voluntary SPE committee activities including the API 17G standard review committee and actively mentoring young professionals.